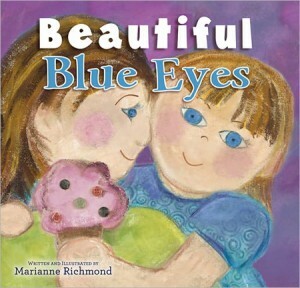 The eyes are the mirror to the soul, and in Beautiful Blue Eyes, by author/illustrator Marianne Richmond, one doting mother gets to see her child’s exuberant “soul” through shimmering shades of beautiful blue. Beautiful Blue Eyes is the story of a mother who watches her child grow and gauges her reaction to the wonderful world around her by the twinkle in her deep blue eyes. Those blue eyes tell Mother when her child is sick, when she’s being silly, or when she’s just being plain stubborn. Mother can even tell how much the child cares for others through her eyes; when she’s sad, and yes, even when she’s sleepy, too. If you like sugary-sweet, this is the picture book for you. It has nostalgia, family bonding and every parent’s favorite – sweet memories of early childhood. I did find some portions of the text a bit bumpy, but overall, I thought the author did a good job. 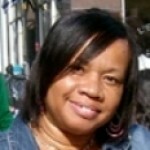 She [Richmond] has also authored over twenty other picture books. This calm book with its warm and child-friendly illustrations makes for great lap book material, and is sure to spice up bonding time in any household. So the next time you’re in the book store, put those baby blues to work. Pick up a copy of Beautiful Blue Eyes.